The Horned Puffin Fratercula corniculata is a pelagic, wing-propelled diving seabird (Charadriiformes, Pan-Alcidae) with an exclusively northern Pacific Ocean distribution. Horned Puffins are 36-41cm in length, with a wingspan of 56-58cm and a body mass of ~612g (del Hoyo et al., 1996). Fratercula corniculata is one of three living species of puffin in the Pacific Ocean basin (also see Tufted Puffin Fratercula cirrhata, and Rhinoceros Puffin Cerorhinca monocerata). A single extant species, the Atlantic Puffin Fratercula arctica, is endemic to the Atlantic Ocean basin. Fossils of puffins are known from Pliocene locations along the eastern and western coasts of North America (Howard, 1971; Olson and Rasmussen, 2001; Smith et al., 2007; Smith, 2011a). Fossil remains of the puffin Cerorhinca minor indicate that these birds have inhabited the Pacific Ocean for at least the last five million years (i.e., since the Early Pliocene; Howard, 1971; Smith, 2011a). Furthermore, The Atlantic Ocean was inhabited by at least three species of puffins in the Early Pliocene (Smith et al., 2007). Systematically, the Horned Puffin is a part of Pan-Alcidae (Aves, Charadriiformes), which includes auks, auklets, puffins, guillemots, murres, and murrelets. Phylogenetic analyses of morphological and molecular sequence data indicate that the Tufted Puffin and the Atlantic puffin are more closely related to one another than either is to the Horned Puffin (Strauch, 1985; Pereira and Baker, 2008; Smith 2011b; Smith and Clarke, 2015). This specimen, a female, was salvaged between Cape Douglas and Chignik on the Alaskan Peninsula from the Exxon Valdez Oil Spill on 7 September 1989. It was made available to the University of Texas High-Resolution X-ray CT Facility for scanning by Dr. N. Adam Smith of the Field Museum of Natural History. Funding for scanning and image processing was provided by an NSF grant (DEB 0949897) to Julia Clarke and N. Adam Smith and by The Jackson School and the High-Resolution X-ray CT Facility. This specimen was scanned by Matthew Colbert on 4 August 2009 along an oblique coronal axis for a total of 1782 slices. Each 1024 x 1024 pixel slice is 0.04459 mm thick with an interslice spacing 0.04459 mm and a field of reconstruction = 42 mm. DEL HOYO, J., A. ELLIOT, and J. SARGATAL (eds.) 1996. Handbook of the Birds of the World. Vol 3. Hoatzins to Auks. Lynx Edicions, Barcelona, Spain. 821pp. HOWARD, H. 1971. Pliocene avian remains from Baja California. Los Angles County Museum Contributions to Science, 217:1-17. OLSON, S. L., and P. C. RASMUSSEN. 2001. Miocene and Pliocene birds from the Lee Creek Mine, North Carolina. Smithsonian Contributions to Paleobiology, 90:233-365. PEREIRA, S. L. and A. J. BAKER. 2008. DNA evidence for a Paleocene origin of the Alcidae (Aves: Charadriiformes) in the Pacific and multiple dispersals across northern oceans. Molecular Phylogenetics and Evolution, 46:430-455. STRAUCH, J. 1985. The phylogeny of the Alcidae. Auk, 102:520-539. SMITH, N. A. 2011a. Systematics and evolution of extinct and extant Pan-Alcidae (Aves, Charadriiformes): combined phylogenetic analyses, divergence estimation, and paleoclimatic interactions. PhD Dissertation. The University of Texas at Austin. 748pp. SMITH, N. A. 2011b. Taxonomic revision and phylogenetic analysis of the flightless Mancallinae (Aves, Pan-Alcidae). Zookeys, 91:1-116. SMITH, N. A., S. L. OLSON, and J. A. CLARKE. 2007. First Atlantic record of the puffin Cerorhinca (Aves, Alcidae) from the Pliocene of North Carolina. Journal of Vertebrate Paleontology, 27:1039-1042. SMITH, N. A. and J. A. CLARKE. 2012. 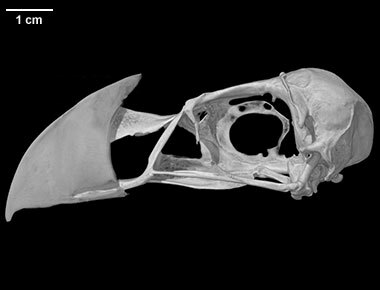 Endocranial anatomy of the Charadriiformes: sensory system variation and the evolution of wing-propelled diving. Plos One, 7(11): e49584. doi:10.1371/journal.pone.0049584. SMITH, N. A. and J. A. CLARKE. 2015. Systematics and Evolution of the Pan-Alcidae (Aves, Charadriiformes). Journal of Avian Biology, 45:DOI:10.1111/jav.00487. Click on the thumbnail to the left for a rendering of the Fratercula corniculata endocast in anterior view. Click on the thumbnail to the left for a rendering of the Fratercula corniculata endocast in posterior view. Click on the thumbnail to the left for a rendering of the Fratercula corniculata endocast in dorsal view. Click on the thumbnail to the left for a rendering of the Fratercula corniculata endocast in ventral view. Click on the thumbnail to the left for a rendering of the Fratercula corniculata endocast in lateral view. To cite this page: Dr. N. Adam Smith, 2015, "Fratercula corniculata" (On-line), Digital Morphology. Accessed April 25, 2019 at http://digimorph.org/specimens/Fratercula_corniculata/.